As a drummer, finding space to fit in a mic stand among all of the toms and cymbals on an already crowded stage can be next to impossible. Fortunately, there are plenty of mic stands to choose from. 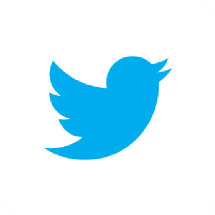 So how will you know what the best mic stand on the market today is? 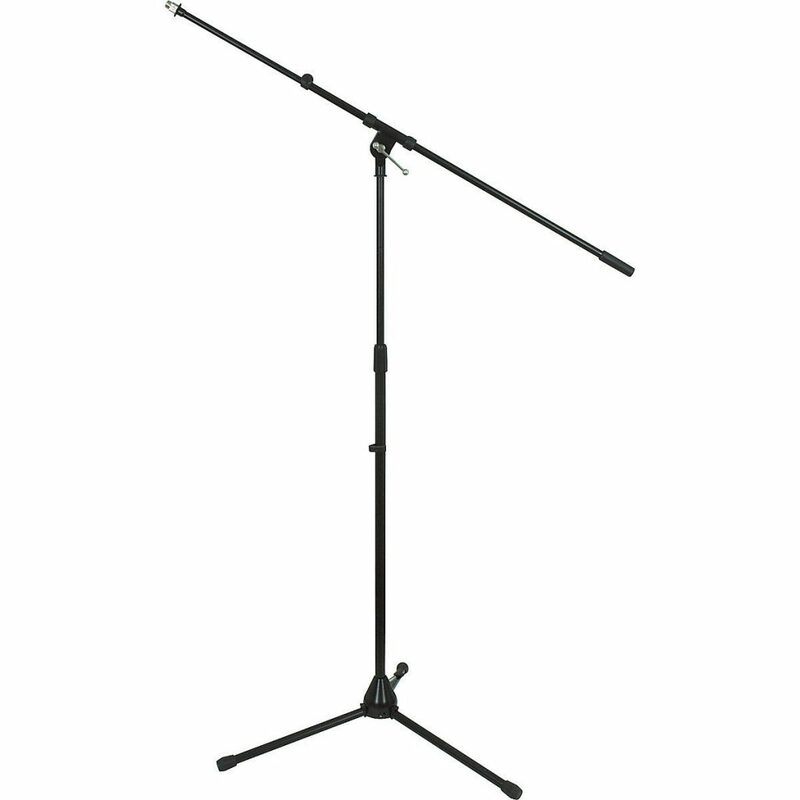 Here, we have the picks for the top 10 best microphone stands for singing drummers. 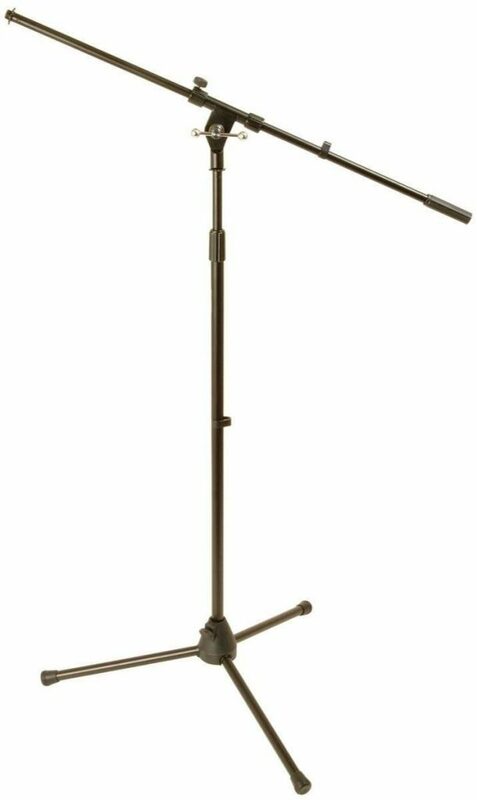 These mic stands were evaluated for various features that drummers look for in their mic stands, including budget pricing, durability, and compactness. Microphone stands are not a one-size-fits-all type of equipment. Picking out the correct one depends on your needs—for example, do you normally play on tiny stages, or do you have lots of room to work with? Perhaps you have a limited budget, and will be fine working with a slightly less durable stand that still puts in the work. Each of these stands should be evaluated on an individual basis depending on your own and your band’s needs. This mic stand from Musician’s Gear is definitely a workhorse. It delivers above-average strength in connections between the boom and the stand itself, and will not slide out of position during rowdy live shows. When the stand is positioned by your hi-hats or ride cymbal(s), there should be no need to extend it the full amount for it to be in a comfortable singing position. The stand does tip slightly when the boom is extended past 75%, but if you are careful about your stand placement there should be no reason to worry about tipping. 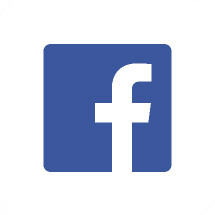 If the stand is moved around and adjusted too much, the screws and connections will begin to wear out. This is fairly standard for low-budget stands, and is definitely something watch out for. For those on a fairly tight budget, this stand is definitely one to consider. 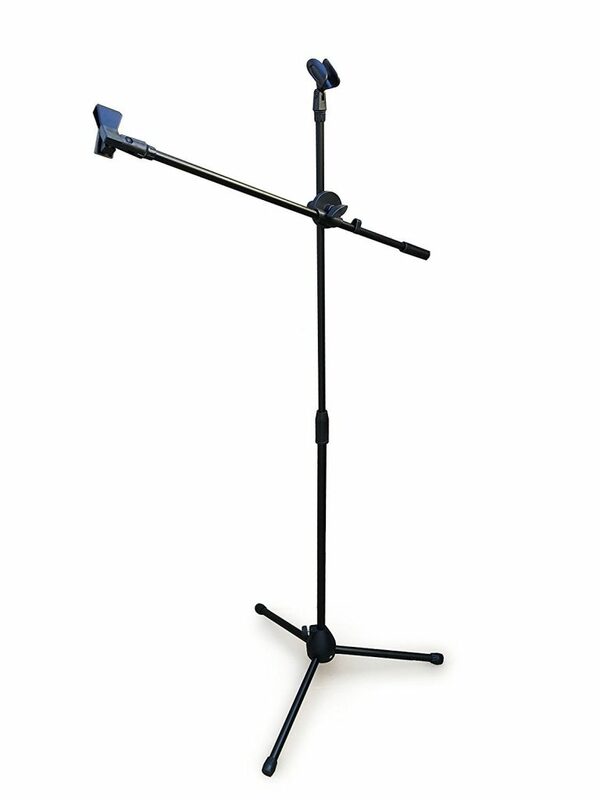 Musician’s Gear’s mic stand is great if you need a stand that will sit behind your drum kit. It can easily reach over cymbals, and proper set up will ensure it’s stable throughout a performance. Sure Luxury is not a name mentioned very often in the music industry, but their mic stand is a sleeper hit. It’s an ideal stand for performing, as the anti-slip rubber feet both mask vibrational sound and stop slippage. 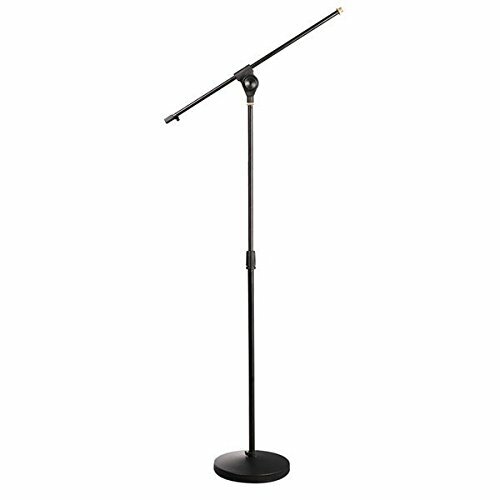 It’s extremely portable, and comes with a safety lock on the boom/stand connector to ensure that the boom does not slip during performance. The mic holder itself is spring-loaded, so the mic stays in the same position without any uncertainty on position. Due to its enhanced portability, the stand is somewhat prone to tipping. If your live shows are particularly crazy or if you need the boom to stretch far to reach a good singing position, this might not be the best microphone stand to work with. The Sure Luxury mic stand is a great portable stand. It’s a certainty that your mic’s position will not change throughout a performance due to its built-in safety lock, and your stand’s position won’t change because of its anti-slip rubber feet. Coming in at a lightweight 5 pounds, World Tour’s MS7 stand is extremely lightweight and easy to take to gigs. That said, it’s also extremely durable. 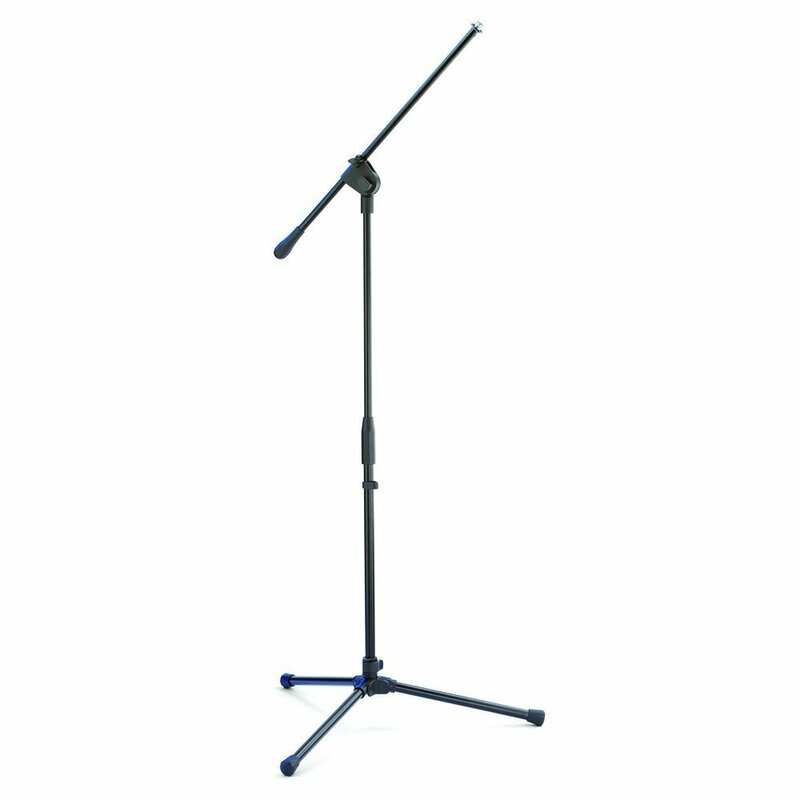 With an upper shaft threaded with hybrid sheet metal and high-impact plastic, this stand can easily hold up to the standard banging around that comes with a good show. The Euro-style boom on this stand makes one-handed adjustments easy, a must for any active drummer and singer. Usually there’s no time to stop drumming entirely to make mic adjustments, so being able to just change length and angle one-handed is a huge plus. The counterweight at the opposite end of the boom gives added stability, ensuring that your mic won’t slip from its intended position. Although the low weight gives this stand enhanced portability, it can also be a downside. That low weight also means the mic stand is somewhat likely to tip if positioned wrong. 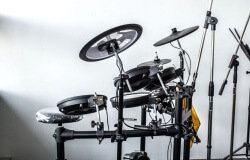 However, the long boom length means there is ample room to work with over your drum kit. World Tour’s stand has a somewhat unique Euro-style boom system, where drummers can make adjustments without ruining the rhythmic or vocal flow of the song. If an unfortunate accident happens and the microphone shifts out of place, a quick one-handed adjustment will bring everything back into place. Ohuhu’s stand is definitely one of the best microphone stands on the market for drummers. With the stand’s legs completely flat, it is as sturdy as a rock. The two interchangeable clips ensure that any type of microphone is compatible with the stand. The Euro-style quick release clamp lets drummers adjust the length and height on the fly. 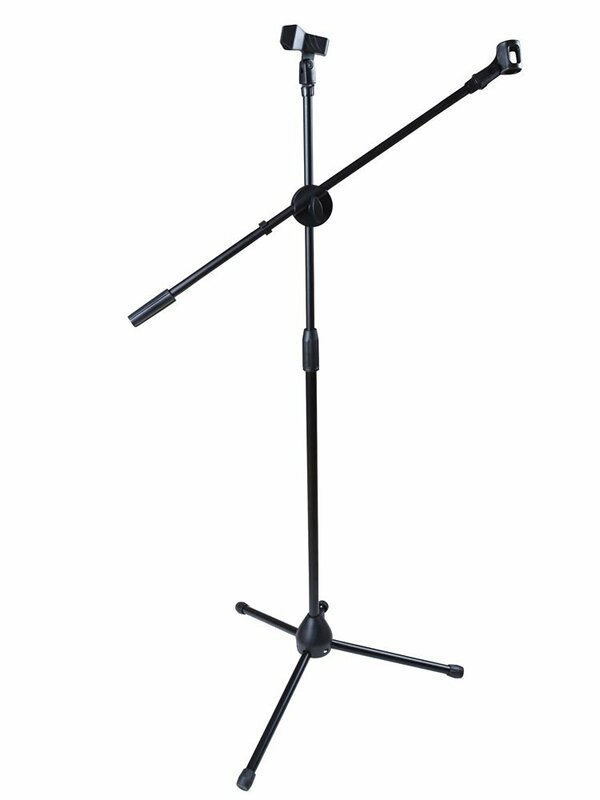 Made of steel and covered in a nice black finish, the boom stand is extremely resilient. Furthermore, the boom can be adjusted to any point on the main arm of the stand, unlike many other stands. This allows for a greater variation in mic height without limiting stability. 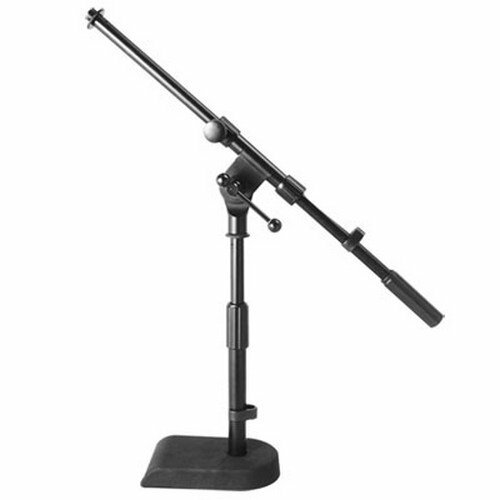 One of the most resilient offerings on the market is Ohuhu’s mic stand. Its high-quality steel ensures that no matter how beat up this stand gets, it will always function. The adjustable boom height is a huge plus as well, giving more stability at different heights. This stand is one of the lightest options in this list. As previously said, the weight comes with positives and negatives. It’s easy to carry around to many gigs, but is likely to tip if placed incorrectly. However, it’s also a little more compact than other options so far. This helps in situations where you, the drummer, may be stuck in a tight corner. The smaller size can make it easier to fit snugly over your hihat. TMS’s mic stand is great for small spaces. It’s ability to weave into niches between drum set parts is uncanny, and is perfect for slotting in directly above your main hihat. As a drummer you know that not all microphones stands are of equal size. Even if you sing, some other parts of your kit will need mic-ing for that proper oomph. Nothing needs to be amplified to proper sound levels like a kick drum. 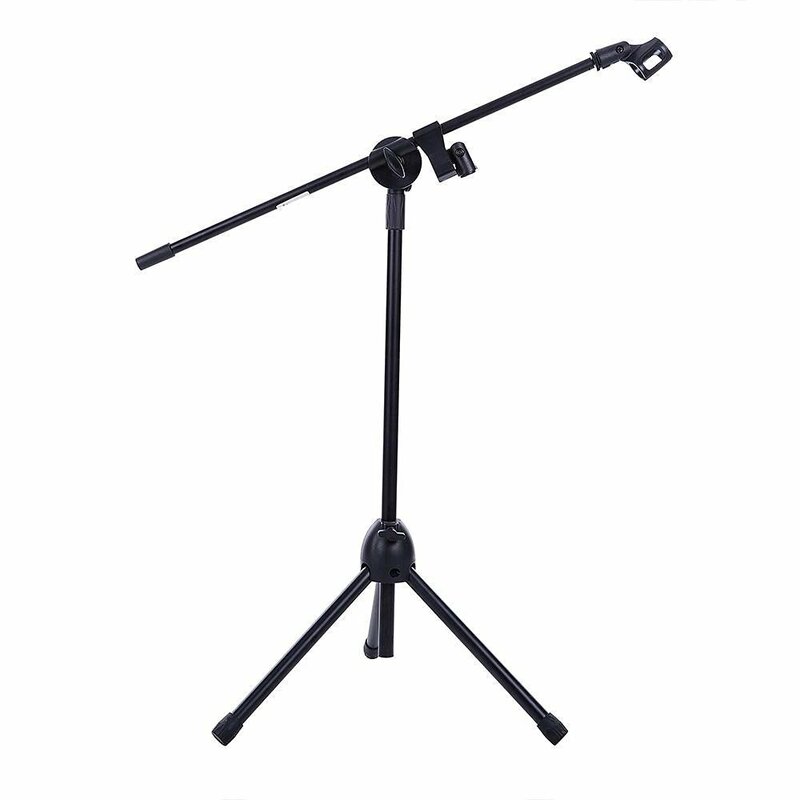 That’s why you may need this smaller mic stand, specifically designed for mic-ing kick drums. The OnStage stand has sturdy parts that hold the mic in place even under the power of a kick drum’s vibrations. The longer foot and rectangular base offset the weight of the mic, ensuring it stands no matter what. It’s small enough to fit on stage even in the smallest spaces. 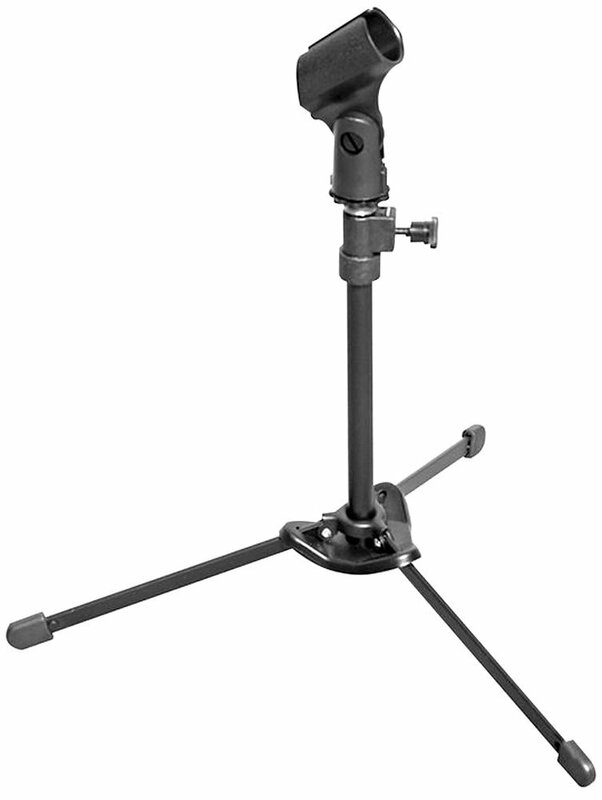 The OnStage kick drum mic stand is a testament for purchasing a stand specific to kick drums. Small and sturdy, this stand will let you get that perfect kick drum sound – provided your bandmates don’t trip over it. Though using a tabletop mic stand as a kick mic stand is unconventional, this is arguably one of the best kick drum mic stands – at least under some circumstances. Because it does not have a boom, there is no chance of the mic slipping from its intended position. 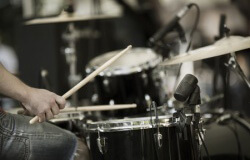 It’s small stature makes it perfect for indie drummers or minimalist drummers who prefer not to cut a hole in the kick drum’s skin for mic placement, but instead like to get the out-of-drum sound. Though it is small and sturdy, it can easily be kicked over. As its original design is for a tabletop, this Hamilton mic stand is disturbed by heavy vibration and needs to be in a somewhat safe spot. Therefore, it’s ideal for home recording and for larger stages. Though not directly intended for use in a live setting, Hamilton’s mic stand is a perfectly viable option for minimalist kick drum mic-ing. It’s tabletop design lends itself to home studio settings, and it’s a great option for outside kick drum placement. With a round metal base plate weighing in at ten pounds, this mic won’t budge in a home setting. Although sturdy at home, the mic’s base plate is not ideal for live settings. When vibrations are strong, the fragility of this stand is easily noticeable. That said, this stand is absolutely stellar for home recording and performance. The plastic-reinforced joints and the pivot knob for adjustment work fantastically, and the boom is nicely weighted. As long as you know exactly where to position and place this stand, it will perform well in most conditions. PYLE’s round base plated stand is amazing in some circumstances, but can be knocked over in others. If you’re looking for a great, sturdy mic stand for singing and drumming in a home studio, then this is perfect. This unique offering from ChargerCity is perfect for drummers who have a more technologically advanced role in the group. As bands become more accustomed to control mixdowns and effects on the fly, drummers often need more and more technology to keep up with these needs. This stand offers an adjustable tablet holder that won’t budge even under heavy conditions. Six different mounts for the tablet come with the stand, and the unit is spring-loaded for extra tablet safety. 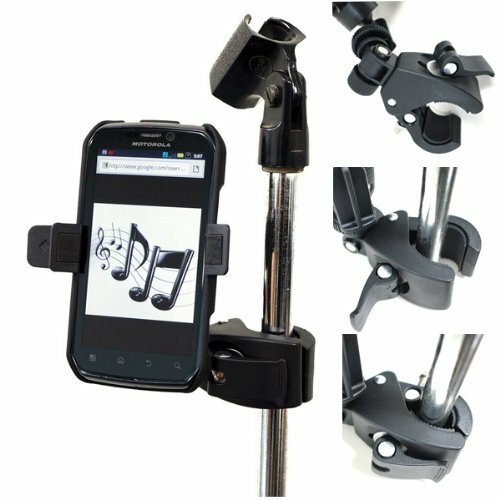 Though very useful for drummers who need access to other technology during performances, this stand is not great for reaching long distances. The boom is fairly short, and the tablet mount also does not stretch out very far. Another boom for the tablet may be purchased for extra distance, but this does not come with the stand on purchase. For the technologically inclined, ChargerCity’s tablet and mic stand is the best option on the market today. Samson’s mic stand offering is the tallest out of the ten options presented here. 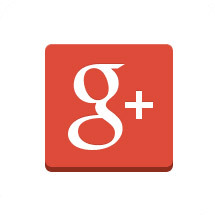 Like many of the others, it can easily tip when positioned poorly. However, the sturdy steel construction and strong microphone grip easily make up for this fact. Though extending the boom too far may be a poor idea, the maximum 65” height means that keeping the boom relatively even is easily made up for with correct height positioning. Like the Biblical character, Samson’s mic stand is extremely durable. It’s height gives it a towering edge on the competition, and is great for larger stages and larger drum kits. 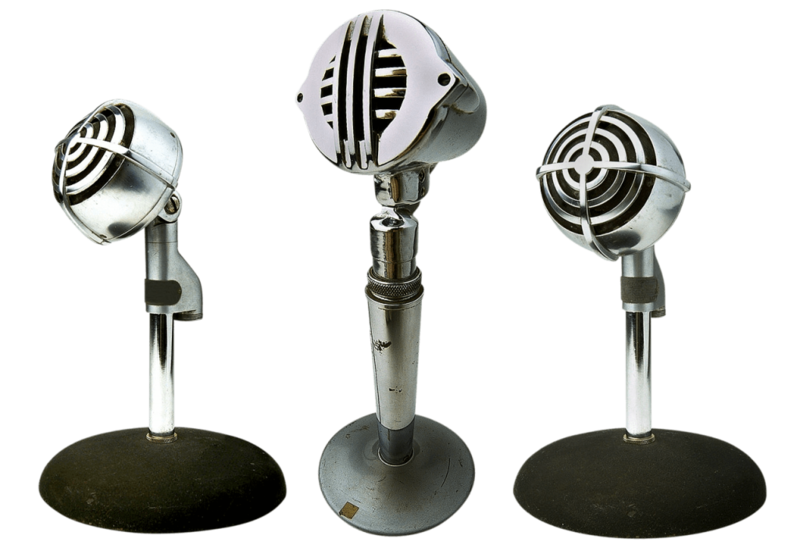 There are a wide variety of options of mic stands to choose from, but knowing exactly what you need before purchasing will give you the best microphone stand from the bunch. For the technology-dependent drummers, ChargerCity’s stand is very well-suited. For those who need to sing and drum simultaneously in many positions, World Tour’s stand with its Euro-style release knob is perfect. Each stand is fine-tuned for the user’s specific needs, and this list will help you hone those needs to the perfect microphone stand. There are a wide variety of options of mic stands on the market that's why we created this guide of Top 10 Best Microphone Stands for you to choose from!